So here’s one of those things that I thought (and hoped) was a joke, but it seems to be legit. 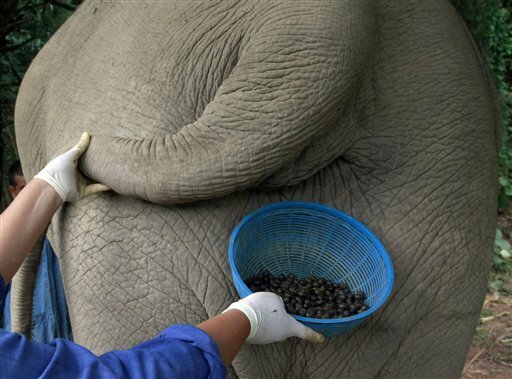 Capitalizing on the high prices of Kopi Luwak coffee, and the massive sizes of elephants’ guys, entrepreneurs in Thailand have put a herd of twenty elephants to work eating and pooping coffee beans to subtly alter its flavor (after it’s been pooped, collected, and washed of course). Or to put it another way, to charge incredible amounts of money due to the scarcity of elephant poop coffee. Yes, I’m more than a bit skeptical of the value of this…there are so many great coffee beans to be found for less than $50 per pound, I just don’t see the value in paying around $500 (yes, five HUNDRED) dollars a pound for coffee beans that have traveled through the intestinal tract of an elephant in Thailand.